Our 4am arrival into Gibraltar in less than great conditions was not such a good idea for several reasons; our chosen marina wasn’t expecting us so early and were unable to put us in our berth so we were directed across the channel to tie up on the fuel dock. No sooner had we secured the lines and fenders (which does take time and effort, particularly at that time in the morning with little sleep) than we were told by armed officials that we could not stay in an unmanned fuel station! We eventually squeezed into a spot back at the Marina and the reason we were evicted – Gibraltar was on high alert for terrorism – sadly now a fact of life in many parts of Europe! 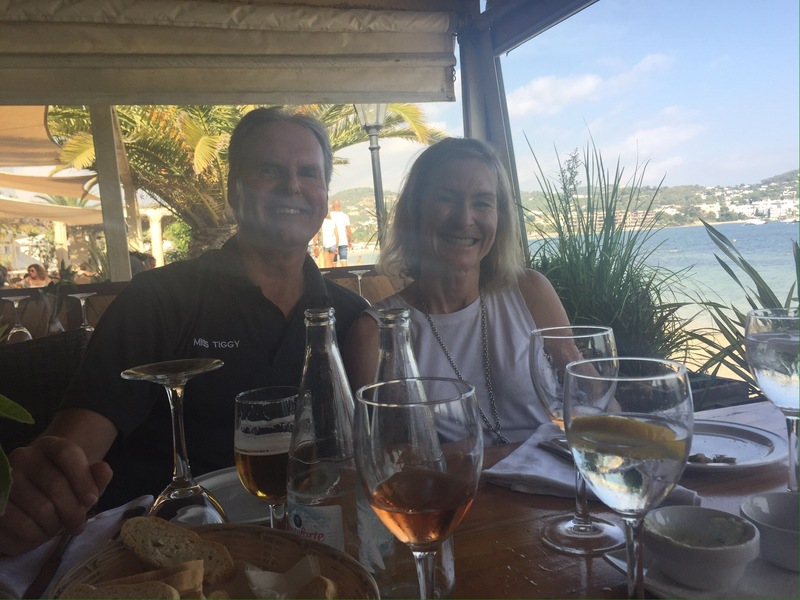 Rob Sharpless is a very keen fisherman so he and Belinda have tirelessly walked the streets of Palma and later Gib, to kit the boat out with the appropriate gear to give us a chance of dining on fish during our time at sea. We did explain that we were seriously bad at catching anything edible from the sea but they persisted and we are very thankful for their incredibly generous donation to our wellbeing! Just to show us how it is done, Rob hooked a 6kg blue fin tuna just as he was pulling the line in at the end of the day which created a heroic display of “saving the bacon”. The tuna, almost at boat side, managed to free itself from the lure to the horror of the onlookers (who saw their sashimi disappear in front of their eyes). In a moment of incredible speed and bravery, trusty Frank gaffed the fish and within minutes had the head off while James watched on weeping at the pools of blood all over his clean teak deck! That evening we dined on the freshest of tuna sashimi and followed this up with several meals of tuna steaks! It has been wonderful having them on the first part of our journey – we have all got on exceptionally well and we hope that they will come back and join us against some point! Our passage across the Gibraltar Straits and the Atlantic (between Morocco and The Canary Islands) including crossing separation zones with ships up to 400 metres in length and travelling at up to 20 knots (35 kms per hour) was an eye opener but we were in the right place at the right time and the weather was favourable! The ocean is relatively benign and the sun was shining! It makes you ponder the differences between life at sea and our land based existence. For example, the simple task of making a cup of tea or coffee, which is not normally regarded as a challenging activity, and which is acted out many times a day is to be given thought and consideration on a boat. Timing is a key factor and the opening of drawers, cupboards and the fridge does depend on which way the boat is heeling, if you want to avoid being stabbed by flying missiles – I copped a large bruise on my foot recently when a cold bottle of cava (for making Aperol spritz) came shooting out of the refrigerator and harpooned my foot. Then, an incredible amount of balance and care is required to get the tea bag or coffee into the cup, followed by milk and or sugar; that is only the beginning. From the galley it can be a series of “Twister” type moves to get the said drink to its rightful owner on deck. Steps have to be negotiated and if the recipient receives their cup with the original contents intact, they are very lucky! Imagine what it is like cooking dinner!! Other issues include visiting the loo in the middle of the night (I will leave that to the imagination) wedging yourself into the shower cubicle and trying to wash your hair on a port or starboard tack, trying not to roll off the bed in a swell, formulating a meal plan that is simple and tasty out of the galley but which is also guaranteed to be as easy to consume in various unnatural positions that you might find yourself in! Days are no longer ruled by meetings, interviews and long periods of time staring at a computer. Rather, a series of watches to make sure that there is always at least one person keeping a close lookout for any potential hazards. During the daytime we have seen large numbers of dolphins showing off around the boat, the odd turtle, various sized ships and yachts which can create an abnormal level of curiosity when they appear on the horizon, particularly square riggers that look deserted with no sign of life! The “Night Watch”is another matter! Times are allocated in 2 hourly stints from 8pm until 8am – James and I drew the 10pm til 12am and then 4am til 6am….not so easy for anyone to wake up after 4 hours sleep and sit alert in the dark taking in only the dots and blips on the radar screen or checking the size and velocity of ships passing in night on the AIS (Automatic Identification System). Big “but”! To see the moon setting out a pathway across the waves is magical! Onwards to the Canary Islands and our biggest test yet – crossing the Atlantic to the Carribean!